Wednesday we bid farewell to the Mosel River valley. Wilfried took us through the new tunnel under Burg Landshut and out into the Hunsrück en route to Mannheim and a train to Munich. I sat in the back seat with Mary driving and Wilfried narrating history and tried to keep track of the towns and highways we went on. Morbach, Birkenfeld, and onto the autobahn east through Kaiserslautern. There was some confusion as to whether we should head for Karlsruhe or Mannheim. Mannheim won as the train there was a little later even though it was out of Wilfried’s way somewhat. We noted the presence of the large US hospital at Landstuhl as well as the Ramstein air base. Somewhere around Neuleiningen the hills and forest of the Hunsrück opened up to the wide Rhine River valley. At the Mannheim Hbf, we said our goodbyes and heartfelt thanks to Wilfried and committed ourselves to the German train system. The first train we didn’t do so well: all the seats were taken and we didn’t feel like hauling our large bags through the whole train to find a seat. We only had to get to Stuttgart, about 40 minutes, before we had a transfer, so we stood in the doorway at the end of the car. After that it was much better. We had seats and I amused myself timing the kilometer posts and calculating our speed. 27 seconds per kilometer equals about 150 kph or about 95 mph. Pretty fast and very smooth. 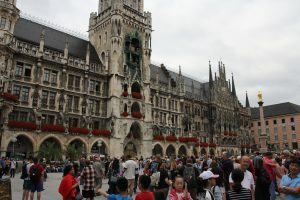 In Munich, we got situated in our hotel then headed out to find the Marianplatz and the animated glockenspiel. It was due to ring at 5 pm and we had about 45 minutes. As it turned out, we needed every bit of that as I misread the map and took us down a street at right angles to the Platz. We saw the dancing figures, along with about 1000 other tourists, pretty much all of whom had their cell phones held out over their heads recording the event. People actually started leaving before it was over. We didn’t, but felt the need for sustenance. We hadn’t really gotten lunch with all our train changing. On the other hand, Andreas had texted us inviting us for dinner at 6:30. Solution: ice cream! Thus buoyed, we walked to our dinner rendezvous. 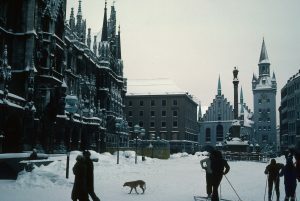 We later figured it was just under 3 km from Marienplatz to the restaurant. Our hotel was about halfway in between so our days’ walking ended up being 6 or 7 km by the time we were done. Andreas had told us Julia was under the weather, so when I first saw her, in her stroller with a pacifier in her mouth and a hood over her head, I thought this might be a bad idea. A few tickle overtures, however, opened the gates and before long she was walking along the street holding my hand. 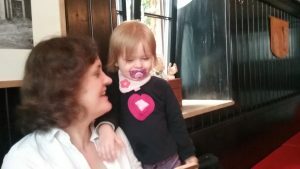 At the restaurant, the food was slow in coming and Julia began exploring. There was no one seated near us, so she pulled silverware off adjacent tables, and messed with the decorations in the window alcoves. I tried a distraction. I asked her if she wanted to come outside with me. She did! We went outside and walked down the street a ways. I pointed out things in my simple German: Bicycle! Motorcycle! At the corner drugstore (luckily closed) I lifted her up onto the window sill and helped her jump down to the sidewalk. Now her eyes were sparkling! After dinner, Luisa had to leave as she was taking a 5 am train to Austria the next morning. The rest of us stopped down the street at a gelato place. Then it was time for all of us to say goodbye. Mary and I walked back to the hotel. We were in bed by 10.